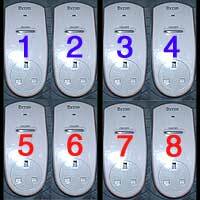 This guide explains how to adapt a United Kingdom 'Byron' RC-10 Remote Socket for disability standard switch use. However, this technique follows for almost all remote control sockets. N.B. Do not exceed a load of 10 amps or 2400 watts per socket. Do NOT use with electric fires, nor large appliances such as washing machines. Flicking complicated devices such as TVs on and off can damage the device. The item is fused, but supervise appropriately. This adaptation allows disability standard switches to turn up to two electrical items on and off, such as lamps, food mixers, bubble tubes, projectors, kettles, vacuum cleaners, fans and so on. 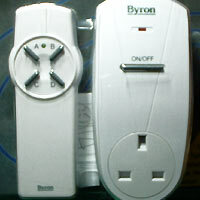 RC-10 Byron Remote Socket Kits cost around £20, with extra sockets for around £13. See www.chbyron.com for help sourcing these, or try www.buy-electrical.co.uk or your local B&Q store. All other components are commonly available from Electronics stores such as Maplin Electronics. Buy pre-adapted: You can buy ready to go adapted Remote Control Power Socket controllers from the OneSwitch shop. 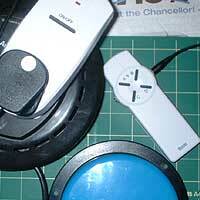 Byron RC-10 Remote Control Socket Kit; 2x 3.5mm mono headphone sockets; thin wire (e.g. 7strand 0.2mm). Soldering iron (15 to 30 Watt power); thin solder; soldering flux; de-soldering braid. Shrink wrap (2.4mm). Cordless drill with 1x 1/4" and 1x 5/32" drill bit; knife or wire strippers; small screwdriver set. This is the rear view of the Printed Circuit Board (PCB). 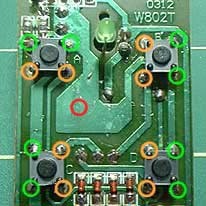 The encircled points are the rear contacts of the four micro-switches for A, B, C and D.
If you touch a green point to an orange point with a wire, the green L.E.D. should light, and the power socket should function. 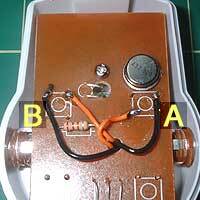 These are two points you can solder a socket to. 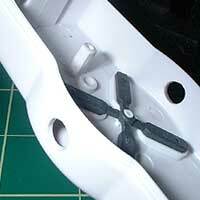 Unscrew and remove the PCB from the plastic housing. Drill a small hole where the red circle is. This is where you will pull your socket wires through, so that you can attach them to the rear of the PCB. Drill 2x 1/4" holes as pictured for your switch sockets, making sure that the PCB will still fit once you've added them. N.B.This is quite a tight fit, so be careful. Solder two 6cm lengths of wire to the socket. Use shrink wrap to insulate your soldering if you wish. 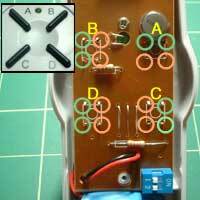 Ensure that the sockets are not touching the PCB as this can cause a short. Either put some tape on the PCB or bend the socket arm out of the way. Solder the wires to the sockets as pictured. If the green LED is continually on, you have a short somewhere. 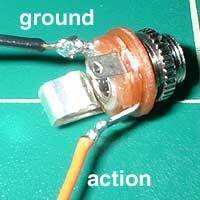 Ensure that the sockets are not touching the PCB by using insulating tape. Make sure that buttons aren't being pressed by a trapped wire. The theoretical limit with Byron controllers is 8 sockets, using 2 remote controllers. As there is not enough room in the remote control for any more than 2 sockets, you will have to be creative in getting around this. One solution is to put the four sockets where the battery goes, then find someway of housing the battery externally. Another would be to bring two dangling sockets out of the case, with a sleeved socket on a wire. Best of luck!